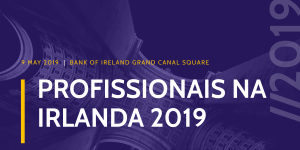 Profissionais na Irlanda 2019, our landmark annual event, will take place this May in Bank of Ireland Grand Canal Square. We’ll hear from a variety of Brazilians in Dublin, about their successful employment experiences in Ireland. We’ll also talk about the best ways to find a long-term job in Ireland. Entry is free and limited to the first 100 people that arrive. Our previous events can be found here.